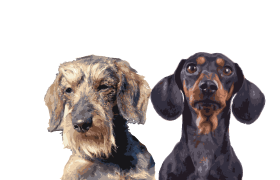 The South African Dachshund Club was founded in 1939 and it was on Wednesday, November 15th, of that year that the first meeting was held at the Vanguard Club, Manners Mansions, Jeppe Street, Johannesburg. The first Committee was formed and the members were: Mrs. MA Humphreys (Chairman), Mrs. E. Gans (Secretary/Treasurer), Mrs. E.G. Ashley, Mrs. I. Saunders and Mrs. H. Wackrill. The annual subscription fee was set at 10/6d. A "Constitution of Rules" was drawn up on 1 December 1939, based on the Rules of the Scottish Dachshund Club, but adjusted to suit South African conditions. It was also agreed at this meeting that the Club would be known as THE SOUTH AFRICAN DACHSHUND CLUB. The "Constitution of Rules" was finalised on 8 December 1939 and a copy was sent to Cape Town for approval. At a meeting held on 26 January 1940 we learn that the "Constitution of Rules" had been approved and that THE SOUTH AFRICAN DACHSHUND CLUB "is now affiliated to The South African Kennel Union of Cape Town". The Club held its first Match Meeting (the term used for an Open Show at the time) at Zoo Lake on 3 February 1940 in conjunction with the Short-legged Terrier Club. The judge was Mrs. Margaret Humphreys and 39 dogs of different varieties competed for top honours. Mrs. I. Saunders's Smooth-haired, JEWEL OF AUDLEY PARK, was judged Best Dog on Show. The second place went to Mrs. E.G. Ashley's Long-haired, WIMBORNE EBBO, and the third place was awarded to Mrs. E. Gans's Miniature Smooth-haired, EVA OF SHOTTS. The judge's comment on the latter exhibit was very interesting: "...very promising, the first I have seen in South Africa." At the Annual General Meeting in 1940, it was agreed that the Club would continue with its activities for the duration of the war and that all members would be on the Committee "to keep in closer touch with each other"! Meetings were, however, only to be held quarterly. This resolution did not last for the full period of the war and by 1944 the Committee had started to meet more frequently. Match Meetings had also been held during the war years in conjunction with the Doberman Pinscher Club, the Gundog Club and the South African Bulldog Club. During the post-war years the Committee worked with renewed energy towards recognition for excellence in all three coat varieties and, in her book on the Long-haired in South Africa, Jane Lowson states the following: "On 8 July 1950, at the DURBAN AND DISTRICTS KENNEL CLUB SILVER CUP SHOW and the Club's third Annual Championship Show, separate C.C. 's were awarded for Long-haired Dachshunds, Smooth-haired Dachshunds and Wire-haired Dachshunds for the first time. The judge was Mr. J.C. Powell. This was brought about mainly by the efforts of The South African Dachshund Club." At a Committee meeting on 22 August 1961 it was minuted that the 4th issue of the Newsletter had been approved and we must therefore assume that the first issue appeared in 1960. The Club's Constitution was revised in January 1962 and the new Constitution was approved at a Special General Meeting held on 26 February 1962. At the Annual General Meeting of the same year, the Club elected its first Patron and President. These honours were bestowed on Mrs. Bridget Oppenheimer and Mr. A.W. Macey respectively. Mrs. I. Saunders became the first Vice-President to be elected by the Club. The year 1962 seems to have been one of great innovation for the Club: The minutes reflect that the design for the Club badge had been approved and that the badges had been ordered. We also glean that a booklet, containing the Constitution and Breed Standard, had been printed and distributed to members. At the Annual General Meeting the following year, Mr. J.C. Powell was elected President, an office he held till 1968. The Club celebrated its Silver Jubilee in 1964 and held a special Silver Jubilee Show in conjunction with Goldfields Kennel Club in August of that year. The judge on this auspicious occasion was Mrs. Muriel Rhodes from England and there were 75 dogs present with all varieties represented. Dogs came from as far afield as Cape Town and Salisbury. To mark the occasion the Club had Dachshund statuettes cast and these were presented to all-breeds clubs to offer in competition at their Championship Shows. Mrs. MA Powell succeeded her husband as President of the Club in 1969 and held this office until her death in 1983. Mrs. Muriel F. Rhodes (U.K.) was elected President of the Club in 1984. After holding the office for 34 years, Mrs. Margaret Humphreys retired as Chairman of the Club in 1973. The reins were handed over to Mr. Bob Jenkins and Mrs. Humphreys was elected Hon. Patroness. Mrs. Humphreys served the Club in this capacity until her death on 27 May 1990 at age 94. She took a keen interest in the Club’s activities right up to the end of her life and the passing of this grand old lady marked the end of an era, not only for the Club, but also for South African dogdom. The Club prospered under the brief but competent Chairmanship of Mr. Bob Jenkins who sadly decided to stand down after only two years. Mr. Paddy Pearson became the Club’s third Chairman in 1975 and held this office until 1978 when he also announced his retirement. Mr. Pearson was elected Hon. Patron of the Club in the same year. Under Mr. Pearson’s Chairmanship an amendment to the Club’s Constitution was approved early in 1975 and a further minor amendment followed in 1978. Mrs. Mady Curtis succeeded Mr. Pearson as Chairman in 1978 and was to hold this office until her death in 1989. During the eleven years in which she served in this capacity, Mrs. Curtis made a tremendous contribution to the welfare of the Club and its members and will always be remembered for her selfless dedication to the Dachshund, especially to the Miniature varieties. She poured her vast knowledge and energy into the Club’s Newsletter which she edited with so much devotion for a number of years, and her enthusiasm was an inspiration to all who had the privilege to know and serve under her. Mrs. Curtis died peacefully on 8 May 1989, and with her passing the door closed on yet another era in the Club’s history. Following Mrs. Curtis’s death, the Club’s Vice-Chairman, Mrs. Irma Lowman, agreed to fill the position of Chairman till the Annual General Meeting early in 1990. Mr. Bruce Jenkins was elected the Club’s sixth Chairman at this meeting, a fitting recognition for the many years he had devoted to the Club and its affairs as Committee member and Secretary. Throughout the early years of its existence, the Club held annual Trophy Shows in conjunction with all-breeds clubs and it was not until 1969 that the Club applied to hold its own Championship Show. To attract entries from other centres, the show was held over the same week-end as those of Transvaal Kennel Club and S.A. Ladies Kennel Association. An American judge, Mrs. Ramona Van Court, officiated on that occasion and 85 dogs of all varieties were present. It is interesting that Smooth-haireds accounted for more than half of the entries and this variety continued to boast the largest representation at shows throughout much of the Club’s history. During the 1980’s, however, the Miniature Smooth-haireds and Miniature Long-haireds gained tremendously in popularity and since the late 1980’s these three varieties have been about equally represented at shows. Since its first Championship Show, the Club had always made every effort to have an overseas breed specialist judge at its annual Championship Show, thereby giving exhibitors the benefit of an “outside” opinion. There have been only two exceptions - in 1978 when the Club invited Mrs. Margaret Humphreys to judge in honour of her 80th birthday, and in 1981 when the appointed judge from Britain missed his plane and a good friend of the Club, Mrs. Joan Liddicoat, had to step in literally at the last minute. The next milestone in the Club’s history came in 1989 with the celebration of its Golden Jubilee. With so much goodwill and generosity from members, a tremendously successful Championship Show was staged. The hall was lavishly decorated with ribbon and flowers and several dignitaries attended. The guests of honour were founder member Mrs. Margaret Humphreys (then 93 years old) and Mr. G.R. Eva, President of the Kennel Union of Southern Africa. The judge on this joyous occasion was Mr. John Hutchinson Cook from the U.S.A., the latter-day doyen of the American Dachshund and one of the most respected Dachshund authorities in the world. The show attracted a bumper entry of 143 dogs and exhibitors came from all over Southern Africa to share in the festivities with some travelling from Namibia and Zimbabwe. Every exhibitor was presented with a commemorative plate and an engraved sherry glass to mark the occasion. The prizes and commemorative awards on offer at the show were nothing short of spectacular and included leather key rings, sugar spoons, bronze medals and mahogany shields, all adorned with the Club badge. This was also the occasion on which the new Club badge and logo were officially introduced. The Committee felt that the Club had to herald its next half century with a fresh image and commissioned Dirk Joubert to design the new logo and badge, retaining the traditional colours of royal blue and gold. In 1991 the Club adopted a new Constitution to replace the one which, with only minor amendments, had been in existence since the Club’s inception. Apart from the old Constitution containing certain ambiguities, it could no longer accommodate the ever increasing demands of a Club which had grown to one of the biggest breed specialist clubs in the country. Throughout the years the Club regularly presented training courses, workshops and lectures and had always been well supported in its endeavours. At least two workshops, covering a variety of topics, are currently presented per annum. An annual Club Dinner (usually organised in conjunction with the Annual General Meeting in February) and year-end party ensures that members get the opportunity to meet socially and that the Club maintains contact with its members. Amongst its more formal activities are the Club’s Open and Championship Shows, held in February and October respectively. The Club has always been actively involved in rescue work and countless Dachshunds have been re-homed as a result of its efforts. 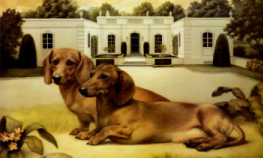 In 1992 the Club’s Dachshund Rescue Scheme was put on a more formal footing with funds being specifically designated for the purpose. This Web site is a natural extension of the progressive spirit for which the Club has become known over the years. 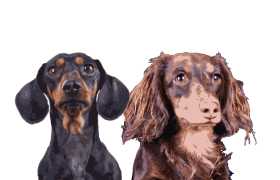 Its aim is not only to promote a love and better understanding of the Dachshund, but also to foster the very special responsibility which comes with dog ownership. 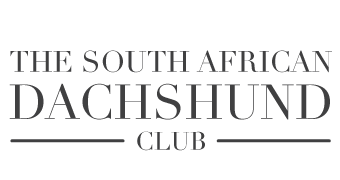 The www.dachshund.co.za is hopefully also a testimony to the Club’s commitment to providing and ever improved service to its members.